In the last couple updates, I've waffled a bit on whether there will be another wave up or not -- my apologies if I've confused anyone. The simple fact is, there are conflicting signals across markets right now, and frankly I'm feeling a bit flummoxed trying to parse the information at the moment -- so I'm going to share some of the things I'm seeing and let readers draw their own conclusions. One of the most telltale patterns in Elliott Wave is called an expanded flat. Expanded flats consist of two 3-wave structures, followed by a five wave structure. The first 3-wave move runs counter to the previous trend, the second one runs with it, and the third wave runs against it and is virtually always the longest and fastest. Here's the key with expanded flats: that second three wave move (in the direction of the trend) actually exceeds the previous high or low. In other words, in a bull market, that means the correction makes a new high. The diagram below depicts an expanded flat (on the right side; to the left is a standard zigzag correction). Expanded flats offer clues toward projecting the market's next move. Back in November of 2012, the apparent three-wave rally into the prior high is the main thing that kept me looking in the right direction, and anticipating that decline would be bought and ultimately make new swing highs. We all know how that turned out. One index is currently flaunting a quite brazen three-wave rally into the most recent high, and that's the index whose abbreviation actually sounds like "index": the NasDuck 100 (NDX). The pattern in NDX screams expanded flat -- and with this pattern in place, it's really hard to imagine the final high is in. Assuming Apple (AAPL) continues up into my next target zone of 510-530, perhaps that will be the catalyst which drags NDX to another high. To the downside, wave (4) is not allowed into the price territory of wave (1), therefore the wave (1) peak is the invalidation level for blue wave (4). 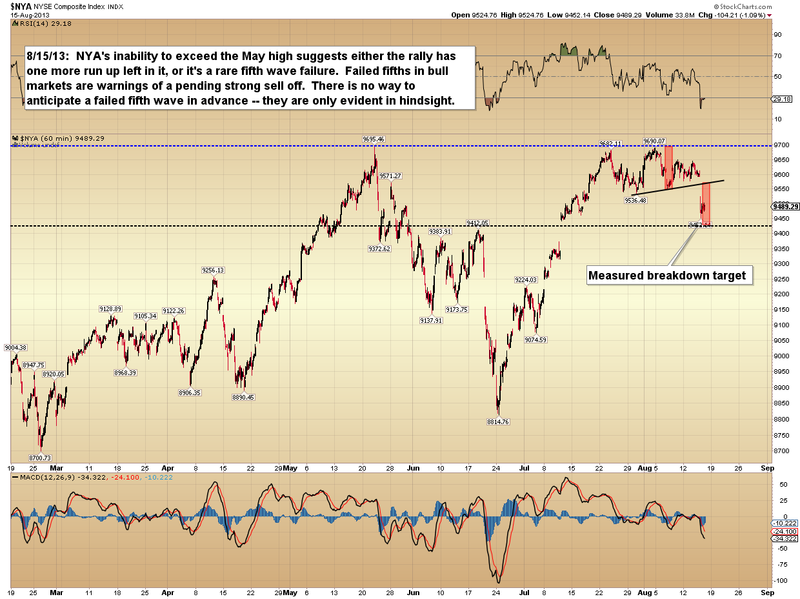 Then there's the NYSE Composite (NYA), which is the market that's recently thrown me onto the waffle train. 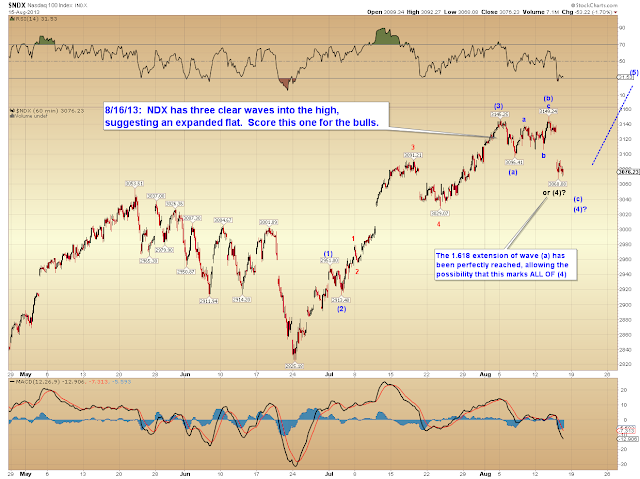 NYA has thus far failed to exceed its May high, which is the minimum expectation of a fifth wave. Failed fifth waves (where price does not exceed the previous high) are rare; statistically speaking, the odds of a failed fifth are perhaps 1 in 80 -- so, purely from an odds standpoint, we have to put this index in the "one more high" corner as well. 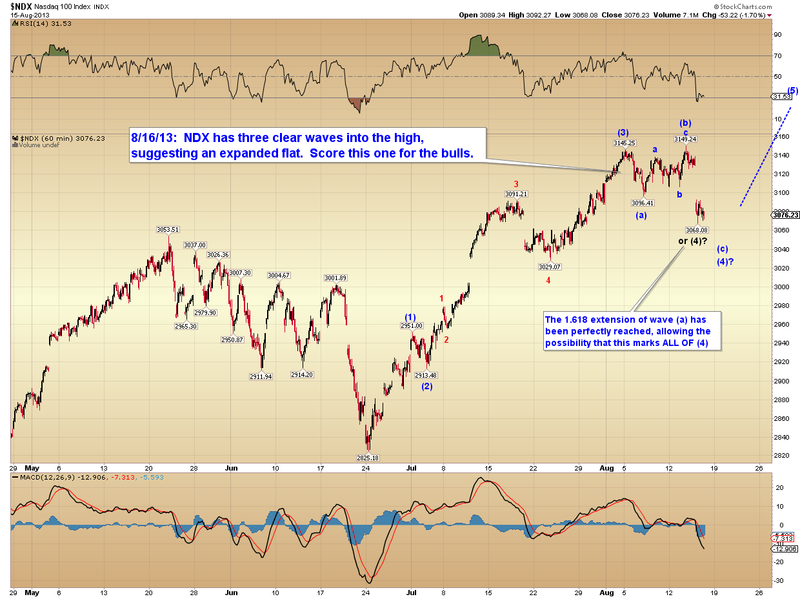 Then we have the S&P 500 (SPX). 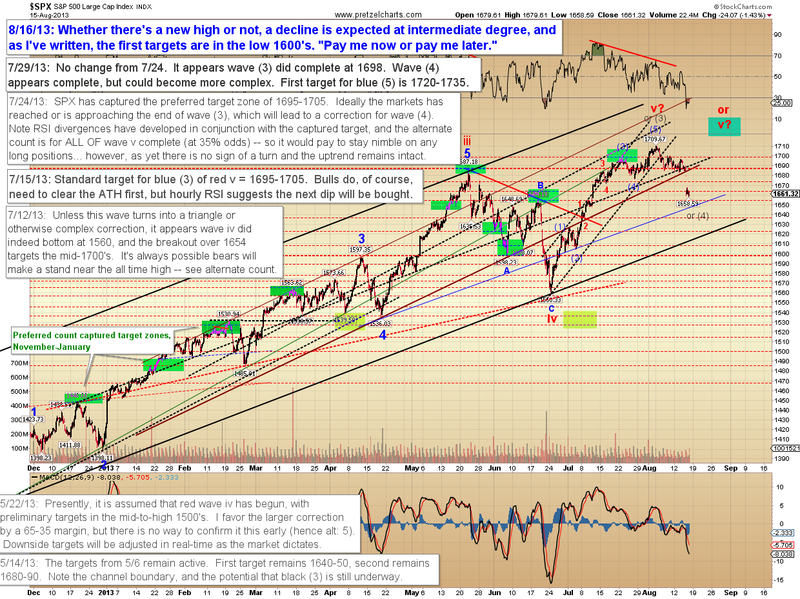 SPX has a passable five-wave rally into the high, but it's extremely messy. In fact, back when we were still trading in the 1700's, I wrote that the recent rally had "an aura of b-wave slop," and noted an expanded flat as the alternate count. The biggest trouble I'm having here is that most of my indicators are signalling a decline at intermediate degree is reasonably imminent, which is causing me to scratch my head about any theories of another new high. Logic also dictates that with the massive break we just had, and the head and shoulders top that formed over several weeks, people are going to be anxious to sell into the next rally. That creates overhead resistance, and I have to ask myself how likely a new high would be under such conditions. On the flip side of that coin, bears are champing at the bit to play a decline, so we can speculate that perhaps there was a lot of shorting into the hole yesterday, which, ironically, could provide fuel for a rally. Speculation aside: just looking at the price pattern, given the solid head and shoulders top and yesterday's clean gap down which undoubtedly trapped a lot of longs, we probably have to put this index in the bear camp... but it's a close call, and the thing bothering me here is that my first read is usually the right one. My first read, back when the market was still rallying, was "expanded flat." These are a few of the conflicting signals I'm wrestling with. I realize people want their calls loud and clear, but as I've hoped to convey by sharing this discussion, I don't feel it's is as cut and dried as any of us want it to be. In the end, as I've written for the past week, my loud and clear call is unchanged: and that's for an intermediate decline, whether we make a new high or not. Trade safe. 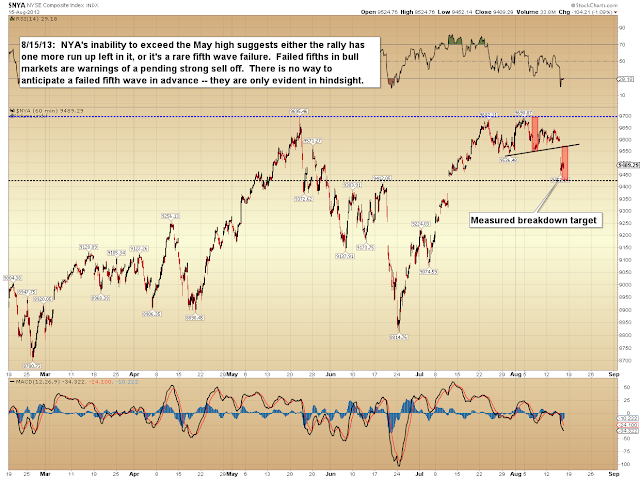 The price action on the SP500 has been a bit weak lately. As the index moved higher in a few attempts, it was slowly dragged lower. Put in some shorts at 1687. lets see what happens. Right now that the SP500 is sitting at it's 50 day SMA (around 1655) it will be interesting to see if it bounces here or continues further down. In the past, the 50 DMA has shown to be a good support level except in the May to June period where it just kept going lower. Happy trading !